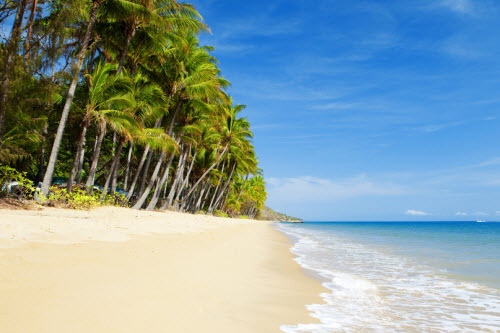 Discover cheap holiday packages to Cairns from New Zealand. It's a smorgasbord of things to see and do. It's home to the Great Barrier Reef, rainforests, delicious food and so much more. Whether you're looking for the ultimate outdoor holiday or want to swap NZ's cooler winters for a tropical climate, Cairns won't disappoint. Don't stress yourself out with trip planning. Keep things simple by booking a flight and hotel holiday package deal. Webjet has exclusive packages which include affordable flight options to Cairns and your choice of hotel stay. Sit back, relax and let Webjet find the best holiday package deal for your trip to Cairns from New Zealand. Cairns is the gateway to some of Australia's top natural attractions. You're only a stone's throw away from the Great Barrier Reef, the Daintree Rainforest, Cape Tribulation and much more. With a direct flight time of only 4h 40 min and so much to see and do, it's little wonder why Cairns sees hordes of Kiwis holidaying here every year. Plus, nearby Queensland resorts are ideal for travelling families. You won't have a problem finding kid-friendly accommodation, activities, and food options across a range of different budgets. Adventurous New Zealanders can spend their days exploring Cairns underwater heritage. There are snorkelling tours to a nearby coral reef, pristine dive sites and glass-bottom tours for those that don't want to get wet. Cairns is also one of Australia's most affordable city destinations. You'll pay around AUD 15 for dinner at a restaurant, AUD 2.40 for a bus ticket and admission costs into wildlife parks start at AUD 20. The city itself won't disappoint either. It's known for its energetic nightlife and Tjapukai night fire where the 40,000-year tradition of Indigenous culture and storytelling happens. Cairns boasts some of the world's best seafood. It's the perfect destination for foodies who want to delight their taste buds with the city's abundance of exotic ingredients. 5. Weather: The best time to visit Cairns is during its winter season. From April to September, temperatures will be slightly cooler with minimal rainfall. You'll also be in time for the migrating humpback whales. The summer season (October to March) sees heavy rain, and humid weather but the rainforests surrounding Cairns are at their finest. 6. Getting Around: It's easy and affordable to get around Cairns CBD without a car. But if you want to explore some of the outer regions, like the rainforest and tablelands, you'll need to hire your own set of wheels. 7. Drinking Water: It is safe to drink the tap water in Cairns. 8. Wi-Fi: If you need to get online, head to a nearby Maccas (McDonald's). The Wi-Fi is free and you can avoid expensive data costs.